My great-grandmother Winifred and my grandfather, around 1941 or 1942. Somehow, I have become the resident family historian and family tree compiler. I'm not sure how I declared myself into this position, but being the oldest grandchild on my father's side of the family probably helps. Also--and this is my interest in all things historical coming through--I love geeking out over old photos and old maps. Just this past week, I found a website with a 1750 map of the city of Bristol and I zoomed in and zoomed out and took note of the River Frome and River Avon's course and where certain landmarks were for my novel, which takes fifty years later. But with such an old city, it seems unlikely that very much really changed. And I really wanted to find a map of Bristol before the work on the Floating Harbor began, as it changed the landscape of the city. For my time period, of course, there are no photos. But there are extant fashion plates and portraits, sketches of farms and street scenes,not to mention those beautiful Georgian buildings and country houses. It's enough of a visual aid and I find that watching a documentary or looking at reproduced sketches helps me to incorporate something into the mental movie of my novel easily. I'm lucky to have old family photos. I've seen them ages ago, of course, but I wasn't actively doing a family tree project the last time I saw them. First, the ridiculous. When my grandfather returned from World War II, he brought home some souvenirs from his time in the Pacific--bullet casings, photos of his pet spider monkey, malaria...and a dud grenade. At least, I hope it was a dud. The accompanying photo didn't come out clearly on my iPhone, but it's quite amusing. 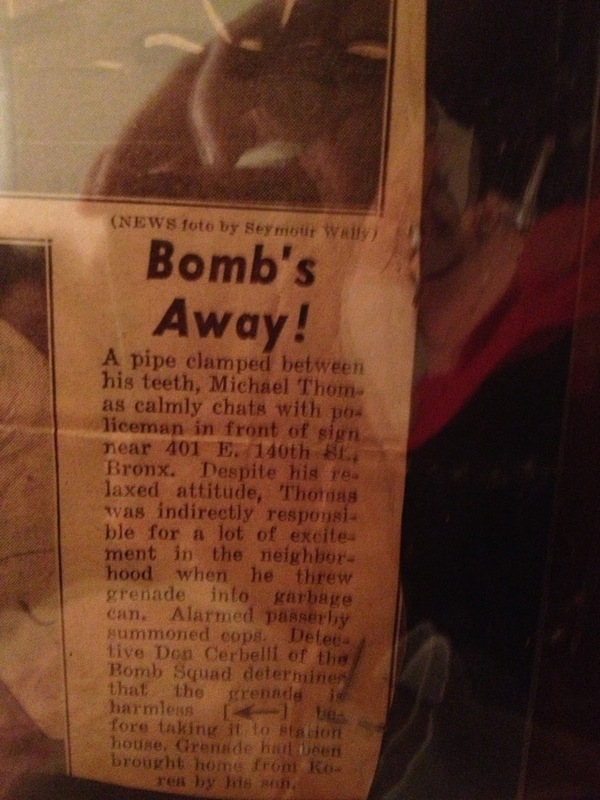 My great-grandfather is talking to a cop, with a pipe in his mouth, like, "Yeah, I threw out a grenade. So?" Without the article being saved in an album though, finding it in archives would be impossible because the reporter got the last name wrong (Thomas was my great-grandfather's middle name, not his last name) and Grandpa wasn't in Korea. Of course, these family images allow me to see my ancestors, who are usually just names and dates and a few anecdotes to me. 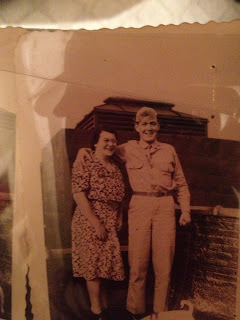 The first picture is my paternal grandfather and his mother, sometime after his enlistment in World War Two. I have his dogtags. His mother's name and address is on them as his contact info. What make this picture poignant is that his mother, my great-grandmother, died in 1942 or 1943, while he was away at war. Also, can we talk about how high men seemed to wear their pants in the 1940s? And then there's this photo below. My paternal great-grandmother (the one in the first picture) was named Winifred. 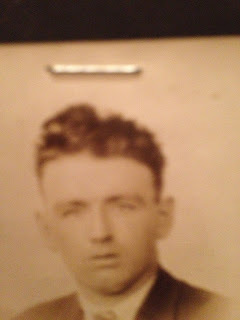 Winnie's brother Thomas immigrated from Ireland to the U.S. in 1928. Well, as I was taking pictures of these photos on my iPhone, my uncle told me that he thought the man in the picture was this Thomas or maybe it was a cousin. He wasn't sure. So I went back to my Ancestry.com family tree and re-read Thomas Scally's naturalization records, where I found that, like many of my ancestors, he changed his surname from Scally to Skelly on the form. I swear, half of my family was trying to run away from the cops or the British or the IRA or something, the way they changed their names. So then I ran a search for Thomas Skelly. I found another naturalization record, clicked on it, and saw a photo. It's the same photo I took a picture of, the same one in the old album that my uncle had. So now we know who the man is and how he's related to us. This naturalization form is from the 1930s. Let's talk about the extremely severe haircut. Clearly, period dramas don't always go for historically-accurate hair. Matthew Crawley's floppy 1920 hair, anyone? What kind of old family photos have you seen? Did you note the details not only of the person, but of the times (dress, hair, the fact that no one smiles...)? If you write historical fiction, are there photos from your time period? If not, what kind of images are there?